3 bedroom 2 bath Private Park and play area! Come and visit the nearby Ponies! Come play, unwind, and visit Yosemite all while staying at the Yosemite Pines Retreat in the Woods located only 37 miles away from the Yosemite National Park via highway 140 West gate entrance and 32.8 miles via highway 41 south gate entrance . 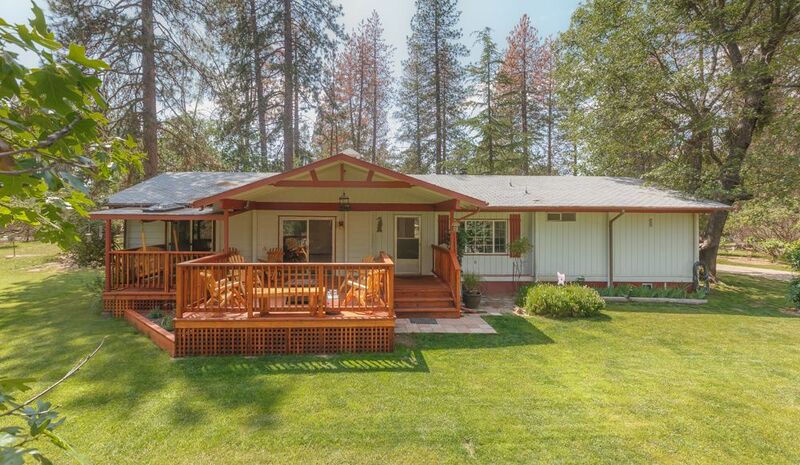 This ranch style vacation home is perfectly situated amongst a peaceful and serene setting in the mountains. The Yosemite Pines Retreat is the perfect place to come and enjoy! During your stay you will be able to enjoy nature with views of 100 + year old ponderosa pines, deer, bunnies, and wild turkeys. You may choose to meditate and sit in the heavenly garden while listening to the tranquil garden water fountain, or play a lively game of horse shoes, make some smores at the fire pit and enjoy the view of the milky way from the spa! Or even play a game of ping-pong! For the little ones we have a play set, that is a two story playhouse with swings, a slide, and even a climbing wall! But the best thing of all for the Kids and adults too is visiting "Buddy". Buddy is a 30 year old retired therapy pony. He has spent many years visiting children in hospitals and making them smile. We encourage our guest to come and have a visit with Buddy, he loves the attention and especially loves it when the kids brush and love on him. Whatever you choose to do it is guaranteed that you will enjoy the many amenities that Yosemite Pines Retreat offers. Featuring a roughly 1,600 sq. ft. home of living space, 3 spacious bedrooms, two full bathrooms, and a fully equipped laundry room. This home is a perfect secluded retreat for a large group (housing up to 10) or a quiet romantic getaway for two. Linens, bedding, towels, paper goods, trash bags, dish washing and dishwasher soap and hand soap are all provided. The kitchen is fully equipped, with attention to detail, and has everything you'll need to prepare and serve your meals. The brand new dining table seats 10 people comfortably. This quiet property is ideally located allowing guests to partake in all the outdoor activities the Yosemite area has to offer. You can hike all of Yosemite's trails including Half Dome, white water raft on the Merced River, fish, mountain bike, walk along the Merced River, swim and boat at Bass Lake, and enjoy walks and hikes in the Mariposa area. Downtown Mariposa also has concerts in the local Art Park every summer weekend and has art galleries and museums for you to enjoy. Whether you are here as a family or after a quiet getaway, you will be able to enjoy the abundance of activities all easily accessed from our Retreat. Yosemite Pines Retreat in the Woods is truly a slice of heaven that will leave you feeling refreshed and ready for your next adventure after your stay. We look forward to sharing our vacation home with you and hearing about your Yosemite vacation experience! Hi, my name is Beth. I have been a resident of Mariposa for most of my life. I love it here and would also love to share the beauty of the area with everyone. The photo at left was taken June 6, 2015. It is me and a great friend riding in Yosemite Valley and it just says it all. The beauty, the history, the surroundings. toilet, combination tub/shower, Fully remodeled bathroom, Dual sink marble vanity top. We provide all necessary linens to make your stay comfortable. Not used for parking. Houses a ping pong table. I-pod or cell phone capable for listening to your favorite music. Chess, Checkers, Monopoly, Ping Pong, Darts, Horse Shoes, Small tents available. Large outdoor play set with swings playhouse and slide, Chess, Checkers, Monopoly, Ping Pong, Darts, Horse Shoes, Small tents available. Large yard and lawn area with beautiful flower beds and water fountain. With more than ample room for the children to romp around. This is truly like your own private park. Front deck comes with a gas fire pit, and log chairs and coffee tables as well as a log swing perfect for your morning coffee time or juice. Back deck is where the Barbecue and table and chairs are. Seats 7, Lighted built-in waterfall, relax under the stars. Bringing our 4 young kids to Yosemite we found the property perfect. The home was clean and well kept with all the amenities we could want, including a jucuzzi. The scenery was breathtaking and Beth was the perfect host, professional, warm, and friendly. She gave us s’mores ingredients to roast with the kids, gave us a bottle of wine to celebrate my birthday, and best of all brought the kids over to see her pony. We recommend anyone wanting to take advantage of the area including Yosemite to consider staying here. Thank you. We really enjoyed our three night stay here. It's in a peaceful location with the owner close by and is a spacious property that worked well for our family of four. Good bathrooms and a well equipped kitchen albeit a little dated. High speed Internet (easily good enough to stream videos) and modern TVs in the lounge and bedrooms. Beth, the owner, welcomed us and gave us some pointers and was on hand if we needed her. Hello Tim, I am not sure if you confused our home with a different one? If not I am sorry if you felt it was dated? All of our appliances and kitchen supplies are only a few months old. I am glad you enjoyed your stay and will return. This house was perfect for us. Very kid friendly loved the views of the mountains. Very clean and quiet, my family enjoyed the stay and hope to go back again in the summer. Enjoyed our short and sweet stay very much. We enjoyed our christmas trip here. Beth was very accomodating and nice. She gave a great recommendation to go around yosemite. The house is clean and super comfortable. We love all the amenities including the pony. Definitely one of the best place to stay! !